Join us at 2pm SLT today, Monday 17th December, for the last show in our current season of Designing Worlds at our studio in Garden of Dreams when we’ll be visitng Ballet Pixelle to learn about how they have created a virtual world ballet company in Second Life – and all about their Christmas production. 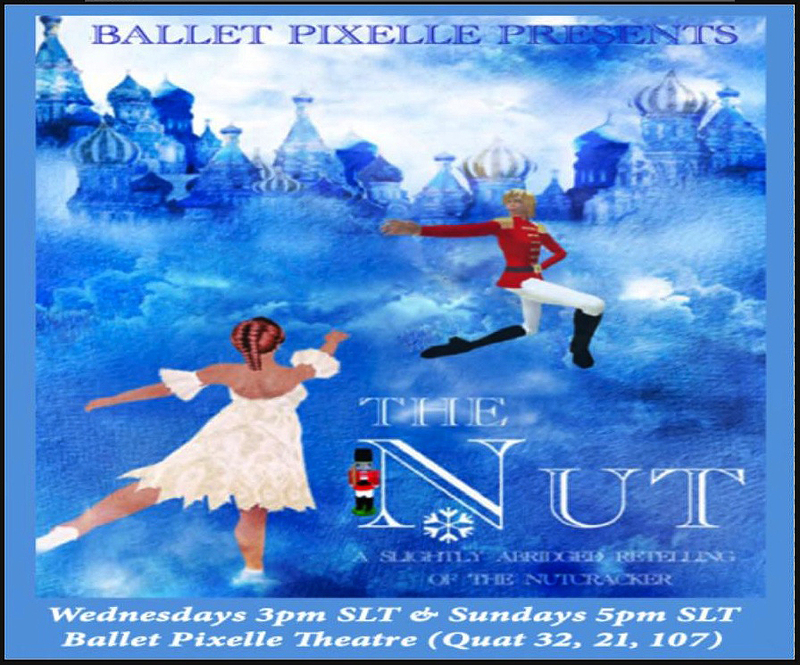 The Nut is based on The Nutcracker ballet, with music by Tchaikovsky, and is a standard part of Ballet Pixelle’s repertory – but each year something new is added – and this year is no exception! We talk to Inarra Saarinen, Artistic Director of Ballet Pixelle, Vivienne Darcy, Ballet Mistress and Company Coordinator and to members of the company as we learn about the challenges and triumphs of staging amazing ballets in a virtual world. It makes for a fascinating show – so make sure that you don’t miss it! Do come and join us at 2pm! And find out why Saffia is dressed as a Christmas Tree!